Activision Reveals It's Next Game "Call of Duty: Ghosts"
Activision confirmed that next game in their billion-dollar shooter franchise, is titled Call of Duty: Ghosts. The Game will arrive on PC, PlayStation 3 and Xbox 360 on November 5, dates for next-generation platforms and Wii U version are not currently confirmed. This year’s Call of Duty is developed by Infinity Ward’s, same folks that created Call of Duty 4: Modern Warfare. We definitely hope to hear more about Call of Duty: Ghosts at Microsoft’s big next-gen console unveiling on May 21st. See the first official teaser video below and Press Release for more information. COD lover can Pre-order now from Amazon for $59.99. “Infinity Ward set the gold standard for first-person action for a generation, and they’re going to do it again with Call of Duty: Ghosts,” said Eric Hirshberg, CEO of Activision Publishing, Inc. “Ghosts delivers an all-new story, all-new characters, an all-new Call of Duty world, all powered by a next generation Call of Duty engine, which is a leap forward for the franchise. Infinity Ward is going all-in to create the next generation of Call of Duty worthy of the world’s greatest fans.””Everyone was expecting us to make Modern Warfare 4, which would have been the safe thing to do. But we’re not resting on our laurels,” said Mark Rubin, executive producer of developer Infinity Ward. “We saw the console transition as the perfect opportunity to start a new chapter for Call of Duty. So we’re building a new sub-brand, a new engine, and a lot of new ideas and experiences for our players. We can’t wait to share them with our community.”To see an exclusive first look at Call of Duty: Ghosts tune in to Xbox: the Next Generation Revealed on May 21 at 10AM PDT on Xbox.com, Xbox LIVE or SPIKE TV for the debut of the all-new game from Infinity Ward. “We are consistently thrilled with the overwhelming response received from critics and consumers alike to the Call of Duty series, which has firmly established its home on the Xbox 360 with the game’s largest and most engaged community,” said Don Mattrick, president of the interactive entertainment business at Microsoft. “With Call of Duty: Ghosts, we have no doubt that our longtime partners, Activision and Infinity Ward, will raise the bar higher than ever before for this incredible franchise.”Starting today, fans can begin pre-ordering their copy of Call of Duty: Ghosts at retail outlets worldwide.”There’s no other video game property like Call of Duty. It’s the biggest game franchise on the planet that has had some of the biggest game entertainment launches in history,” said Tony Bartel, president of GameStop. “We are very excited for the launch of Call of Duty: Ghosts, as we transition to next generation consoles.”Call of Duty: Ghosts will release on Xbox 360® video game and entertainment system from Microsoft, PlayStation®3 computer entertainment system and PC on November 5. Call of Duty: Ghosts will also be available for next generation platforms. For the latest intel, check out: www.callofduty.com/ghosts, www.facebook.com/CODGhosts, or follow on Twitter @InfinityWard. Call of Duty: Ghosts is not yet rated. Headquartered in Santa Monica, California, Activision Publishing, Inc. is a leading worldwide developer, publisher and distributor of interactive entertainment and leisure products.Activision maintains operations in the U.S., Canada, Brazil, Mexico, the United Kingdom, France, Germany, Ireland, Italy, Sweden, Spain, Norway, Denmark, the Netherlands, Australia, South Korea, mainland China and the region of Taiwan. More information about Activision and its products can be found on the company’s website, www.activision.com. 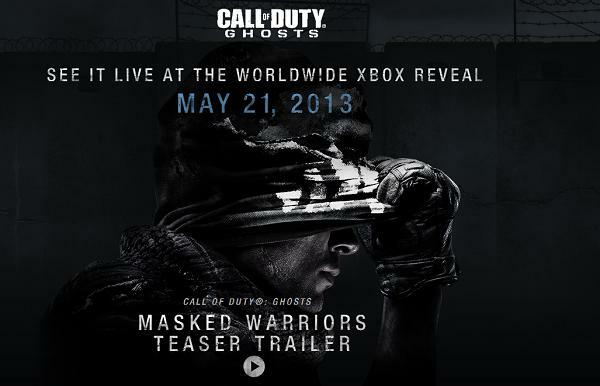 Cautionary Note Regarding Forward-looking Statements: Information in this press release that involves Activision Publishing’s expectations, plans, intentions or strategies regarding the future, including statements about the expected Call of Duty: Ghosts release date of November 5, 2013, are forward-looking statements that are not facts and involve a number of risks and uncertainties. Factors that could cause Activision Publishing’s actual future results to differ materially from those expressed in the forward-looking statements set forth in this release include unanticipated product delays and other factors identified in the risk factors sections of Activision Blizzard’s most recent annual report on Form 10-K and any subsequent quarterly reports on Form 10-Q. The forward-looking statements in this release are based upon information available to Activision Publishing and Activision Blizzard as of the date of this release, and neither Activision Publishing nor Activision Blizzard assumes any obligation to update any such forward-looking statements. Forward-looking statements believed to be true when made may ultimately prove to be incorrect. These statements are not guarantees of the future performance of Activision Publishing or Activision Blizzard and are subject to risks, uncertainties and other factors, some of which are beyond its control and may cause actual results to differ materially from current expectations.# # #ACTIVISION, CALL OF DUTY, CALL OF DUTY MODERN WARFARE and CALL OF DUTY GHOSTS are trademarks of Activision Publishing, Inc. Microsoft, Windows, Xbox, Xbox 360 and Xbox LIVE are either registered trademarks or trademarks of the Microsoft group of companies. All other trademarks and trade names are the properties of their respective owners.